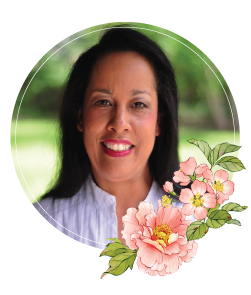 Good morning sweet friends I can’t tell you how grateful I am for your support on my new release on June 13th. We were tickled to introduce the Venise Lace Collection and the creative team had exquisite samples to show. 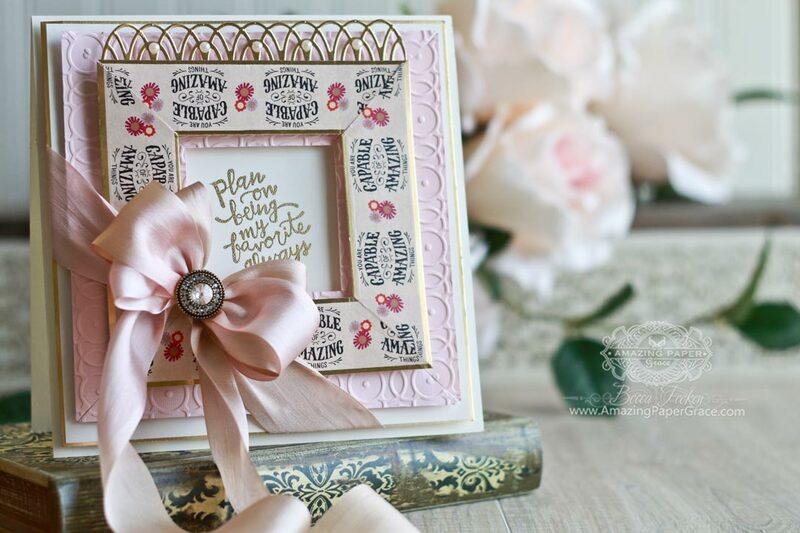 Don’t forget, you have the rest of the day to leave a comment on my June 13 post and the post of each creative team member to win a die from my Vintage Elegance Collection. It feels great to have that deadline behind us and I find myself up before 5am and I’m not a morning person, traditionally. Not sure why I’m not sleeping but if it is worry, I have found the answer for that – creating. I’ve simply been playing around with dies and catching up on emails, Instagram (my current go-to for inspiration) and Facebook at those wee hours. By the way if you have a question on what I’ve used on a card, try me on Instagram – with all the notifications – it’s much quicker and easier than email. Start out with a card base 5-1/2″ wide x 6-1/2″ tall. Add a panel cut with the largest two Hemstitch dies and matted with gold slightly larger than the hemstitch panel. Cut and Emboss two Swirl Bliss pockets – tape on the back so that the pocket retains its shape. Run a piece of ribbon the pockets threading the ribbon through the triangle holes in the pockets. **Permanently adhere Layer 1 to the card base. Cut and emboss Francesca Label, stamp with sentiment and attach to Layer 2 with a triple stack of foam tape. Add bow to left hand side and pearls to embellish. For new readers, every Friday it’s my pleasure to give away a card. The card goes t(When o a randomly picked reader (worldwide) who leaves a comment in our conversation. Want to know more about Day of Giving, here’s a link to my FAQ’s just check out #11. You can check the list of winners HERE! (I’ll be updating the winner’s list soon). I hope you will indulge me to answer the question this week. I’ve had a recent conversation with a reader who was a beginner and was lost making a card – your answer will help me judge how to taylor upcoming posts. Please don’t be shy – I want you to take credit for your accomplishments – if you’ve been able to follow my instructions for some time – you are probably not a beginner. For your comment: What do you consider your card making level – Beginner, Intermediate or Expert? Congratulations on the Blog Hop. All the sample cards and makes were brilliant, but they were from your dies so no surprises there! Today’s offering in stunning, thank you. I have crafted for nearly 70 years but still consider myself an intermediary as there is always something to learn. Don’t worry about sleeping, the more you worry, the less you sleep. WONDERFUL CARD, BECCA! I LOVE the sentiment & what you’d done with it!!!! ;) SUCH A LOVELY CARD!!!! I just love this card! It is simply elegant! I guess that I am probably an intermediate level card maker, although, I am greatly out of practice. I have been attending school for two years and have had little time left over to craft. I am hoping to be able to do more with my cards and crafts once I get a little more room in my schedule. I have so many crafting tools and supplies that I will feel better if I am using them! I truly enjoy all of the beautiful things you make and wish that I can learn how to make such pretty cards. Your style is a favorite! Oh my oh my another stunning creation here Becca. It´s sooo beautiful and well made as usual. I love it… it looks so rich… love the colours you gave used too. such a simple question today yet so hard to answer. as for making cards I am intermediate to advanced. I can usually figure out what is done and copy it or find a way to use it that speaks to me. as far as coloring or original layouts i’m a beginner. I also don’t have a great sense for sizing. nothing is as simple as it seems. The composition of your photo for today’s post is so beautiful and balanced. The colors of the heart and roses are perfect! The card’s pretty spectacular, too! On June 2, you featured a card with a Quietfire stamp and when I linked to that site I ordered the very stamp used in today’s post. I love seeing it on today’s card. I’ve been making cards for a long time and, with your tutelage, I have moved from intermediate to an expert card maker. Fortunately, though, there will always be new things to learn! I suspect the difficulty for a beginner to duplicate your cards is inherent in your sophisticated style. You may be able to tailor your instruction a bit but my sense is that the diversity of your design team will give all levels of card makers options that will work for them. I love seeing such great possibilities! Even though I prefer to make cards that have complexity, when time is limited it’s great to have inspiration for those times, as well. It’s such a joy to witness what a creative and exciting time this is for you. I hope your sleeplessness has less to do with worry and all to do with being excited and inspired! This is georgous, so soft and quiet, so basic and of course your bow just makes it perfect. Some aspect of cardmaking, I consider myself as Intermediate but others I feel I am still a beginner. I am horrible at interpreting instructions,so that makes me say beginner. I hope someday I will be as good as you are. Some people have it; some don’t. Really beautiful card Becca. At the risk of blowing my own trumpet, I believe I am an expert card maker but even so, there’s always something we can learn! Hi Becca, you are an expert, your cards are exquisite. I am intermediate, but always doing my best. Greetings from Australia. I am so glad for all your success!! You certainly deserve it! I consider myself in between intermediate and not expert but excellent, every day I discover something more and I am so appreciative of EXPERTS as you who are so selfless and are an endless source of inspiration! Morning Becca love your card this morning and I consider myself an intermediate crafter. But I am happy with that. Beautiful card and wonderful sentiment Becca!!! That is a hard question…since I have over 200 first place ribbons and a number of ‘best of’, I would have to say I am an expert card maker. HOWEVER, with so much more to still learn and try, I am a beginner!!!! How’s that for an answer – LOL! Love the layering and elegant color combo! Good morning Becca, such a beautiful card!!! I have been crafting one way or another for about 59ish years!!! Card making 25ish but I would class myself a learner even though I’ve been told my cards are and I quote gorgeous!!! I always say anyone can make a card with the right materials and your dies are exquisite!!! Becca, what a wonderful card. I enjoy all of your creations. I really like the way you make your bows. I have had stamps for probably 30 years but I didn’t really start stamping about 20 years ago. I have taught at the local stamp store which is now closed. So I guess you could say I am an expert but just today I try to make a card that took me all day to figure out. Love the colours in this one Becca! As always a beautiful card. I consider myself an expert, though I am always learning! Your cards are just so beautiful….and your bows…. amazing! I would say I am a intermediate card maker. I have learned that a card doesn’t have to be perfect, and by letting that go, my cards have improved, and so much more fun to make! Morning Becca, Stunning !! 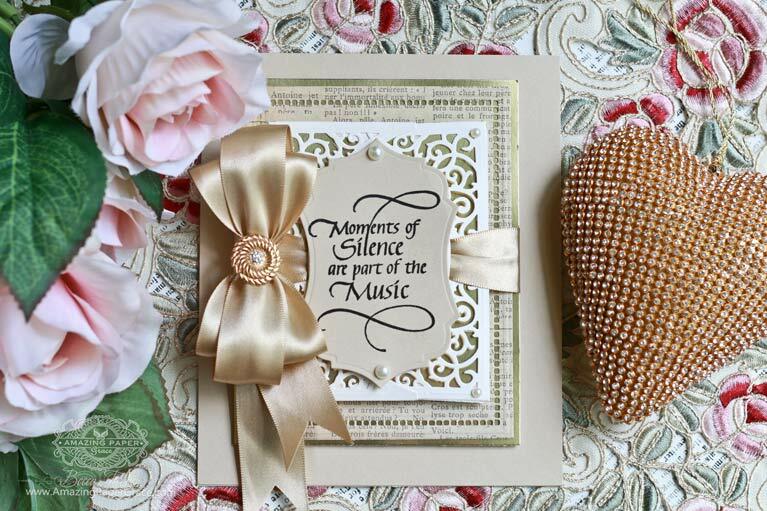 the colours are gorgeous, the die-cuts are gorgeous and the bow is gorgeous, as is the sentiment. I love that you have used script paper for a die-cut too, how effective. I would class myself as Intermediate, I can always understand your instructions. What a beautiful card. The saying really picked me up today. Won’t go into detail, yet what an Awesome God we have! 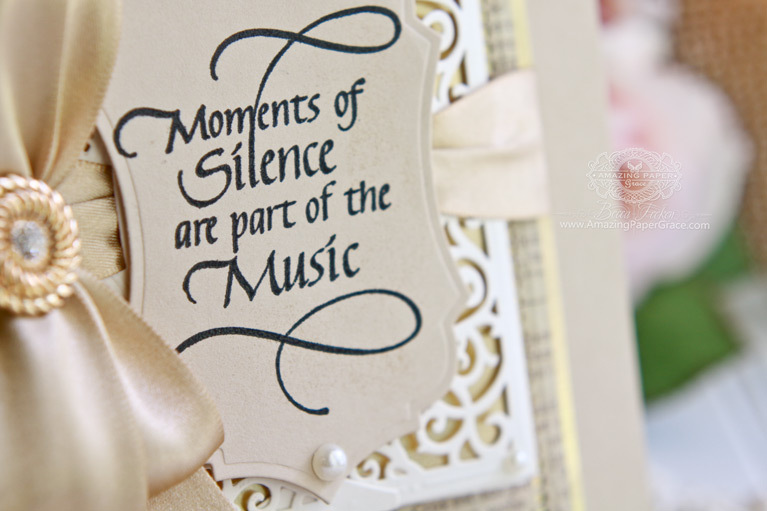 I was so glad to see the instructions included in this posting–beautiful card, your usual classic elegance. It’s so helpful to have the card and layer dimensions given. Your directions are very clear no matter what experience level the reader has if the reader is familiar with the dies used. If not, then any directions would be hard to follow. Is it possible to include in the post the pictures of the dies used? Some blogs do this I guess as a sales attraction and it works and is so helpful, too. KittyKraft does this for Ellen Hutson and it is beneficial. A picture is worth a lot of words. 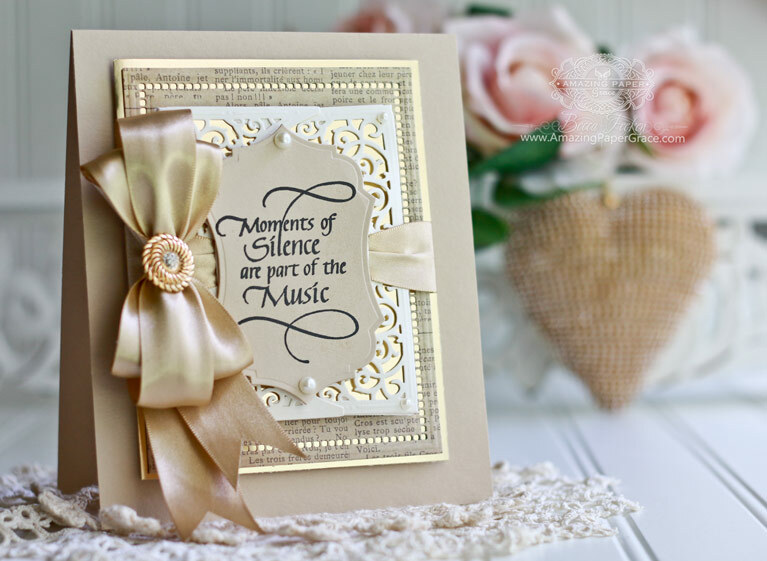 Love the cream colored ribbon and the printed designer paper you used. I really love the new dies! The hemstitch squares are elegant but simple enough to use with more elaborate dies. Hi Becca, Beautiful card as always :) You’re bows are always so heavenly. I am probably classed as intermediate, although I usually feel like a beginner. There are so many techniques I have yet to learn. I think I spend more time trying to match things together than making cards lol Not to mention my bows never look half as pretty as yours. I would love to see a tutorial on how you make them look like that. Oh Becca – I just love the Venise Lace Collection and your projects are simply stunning! Congratulations! I think it would be hard to be an expert in every aspect of card making, unless able to master all the new techniques which are developed and have access to all the supplies needed. I’ve found those who make stunning cards with photographs or their own artwork, metal or fabric, beadwork or collage etc – so many techniques – so little time!! Die-cutting, layering and 3-D work are my comfort zones. I teach a class and have been asked to do demos, but have not yet attempted things like working with cling film, salt and aquatints, paint fusion techniques or what I would term the very ‘arty’ type projects. I am very comfortable with complicated constructions though – must be because my father is a civil engineer! Hope that answers the question!